JACKSON, Miss. (AP) — Nissan Motor Co. announced Thursday that it’s cutting up to 700 contract workers at its Mississippi assembly plant, citing slowing sales for vans and Titan pickup trucks that it makes there. The move follows Nissan’s December announcement that it’s cutting 1,000 jobs at two Mexican factories. Reports in May indicated the Japanese automaker would cut production by up to 20 percent in North America, citing low profits. Thursday’s move comes after the arrest in Japan of former chairman Carlos Ghosn, who led a production expansion in Nissan’s largest market. The company has struggled to sell all those vehicles in recent years, turning heavily to incentives and fleet sales to soak up the excess. Spokeswoman Lloryn Love-Carter said the cuts are unrelated to Ghosn’s ouster as chairman and new managers taking over at Nissan. 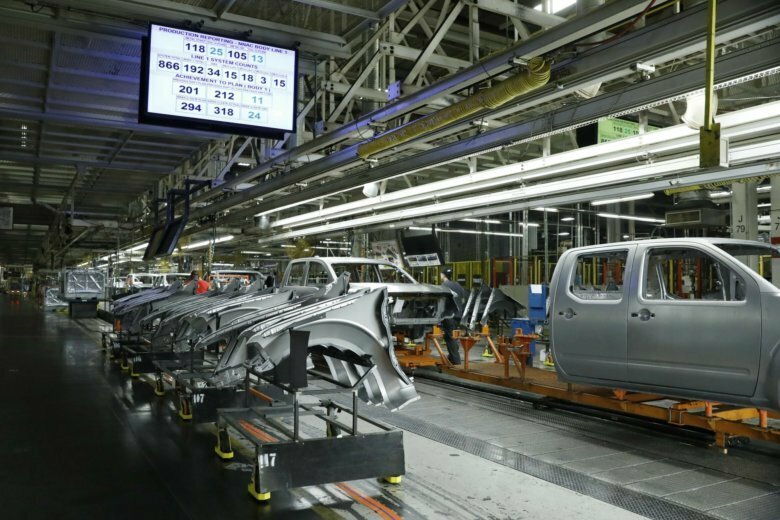 Nissan has 6,400 direct employees and contract workers who labor side-by-side on production lines in Canton, Mississippi, just north of Jackson. The company has long prided itself on a no-layoff pledge for its direct employees in Canton, and Love-Carter said any affected direct employees would be moved to new jobs. But that doesn’t apply to contract workers, who were cut sharply during the recession. “We are doing all we can to mitigate the impact to the associate workforce,” Love-Carter said. The company will reduce production of NV cargo and passenger vans from two shifts to one. It will reduce production of Frontier and Titan pickups from three shifts to two. Sales of the larger Titan fell 5 percent in 2018 to about 50,000, while sales of the smaller Frontier rose 7 percent to 80,000. The Frontier will also face challenges in coming months, as Ford and Fiat Chrysler’s Jeep division introduce new small trucks. Nissan plans a new-model Frontier to be made in Canton, which has a 450,000-vehicle capacity. Love-Carter said production will fall and some jobs will be cut by attrition at Nissan’s 1,600-employee engine factory in Decherd, Tennessee, but that Thursday’s announcement doesn’t affect its 8,400-employee Smyrna, Tennessee, factory. Mississippi officials have pointed with pride to Nissan, the state’s first major automaker. The company says it has invested $3.4 billion in Canton since it opened in 2003, and the company has received what could be more than $1 billion worth of subsidies and tax breaks over 30 years. An earlier version of this story has been corrected to show slow sales for Nissan Titan pickups, not Frontier pickups.